When you have a blocked tear duct, your tears can’t drain normally, leaving you with a watery, irritated eye. The condition is caused by a partial or complete obstruction in the tear drainage system. This means your eyes may be excessively watering, not because you are producing too many tears, but because you are not able to drain the tears you do make away from your eyes. A blockage can occur at any point in the tear drainage system, from the puncta to your nose. When that happens, your tears don’t drain properly, giving you watery eyes and increasing your risk of eye infections and inflammation. The lacrimal glands produce most of your tears. These glands are located inside the upper lids above each eye. Normally, tears flow from the lacrimal glands over the surface of your eye. Tears drain into the puncta, located in the inside corners of your upper and lower eyelids. 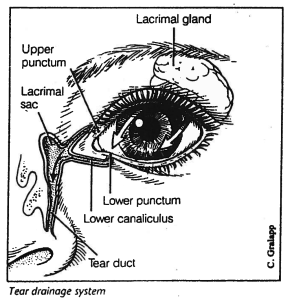 Your eyelids have small canals (canaliculi) that move tears to a sac where the lids are attached to the side of the nose (lacrimal sac). From there, tears travel down a duct (the nasolacrimal duct) draining into your nose. Once in the nose, tears are reabsorbed. By probing and irrigating your tear ducts, Dr. Silbert is able to gage the severity of your blockage. Sometimes the irrigation itself can remove the blockage and provide relief. In those cases, the testing and treatment for their obstruction is the same; however, other patients may have more severe or complicated blockages which will need further treatment. Once Dr. Silbert can assess the extent of your blockage, he will be able to recommend the appropriate course of treatment. If a tear duct obstruction is expected, Dr. Silbert will flush a saline solution through your tear drainage system to check how well it is draining. It is our standard of care to conduct this test on both eyes, even if only 1 is symptomatic. Often, Dr. Silbert will need to dilate the drainage holes at the corner of your eyelid (puncta) first. This is done by inserting a slender instrument (probe) through those drainage holes. By completing this step first, he is also able to check for blockages. Once the puncta is dilated, Dr. Silbert will irrigate your tear duct. This is when he flushes saline solution through the irrigation instrument into your puncta. Patients sometimes state that if feels like water is trickling down the back of your throat. Adults may have this procedure done in the office, often the same day as their initial appointment. If the irrigation proves successful, there may not be any need for further surgical treatment. However, if the irrigation shows a blockage, further surgery may be needed. Children who need a probe and irrigation must have this procedure conducted under general anesthesia. This procedure is done at an outpatient surgical center due to their age. David Silbert, MD, FAAP is one of the leading surgeons in the country for the treatment of Nasolacrimal Duct Obstruction. He is one of the only surgeons performing endoscopic surgical treatments to improve obstruction symptoms. By inserting balloons or stents endoscopically, the procedure is less invasive, safer for the patient, and has no scarring of the face. To learn more about the specific treatments used for nasolacrimal duct obstruction, please see the treatments handout. All images are intended for educational purposes. No copyright infringement intended.